Pretty Bird was the first company to develop and introduce the unique concept of colors and shapes in their bird food. This was done to provide your bird with a dynamic and fun feeding experience. Their special pasteurizing process combines the highest quality ingredients with added nutrients to produce the most delicious flavors, aromas and fruit-like colors and shapes. Although each morsel of food is the same, the different colors and shapes will give your bird the feeling of free choice while offering balanced nutrition. 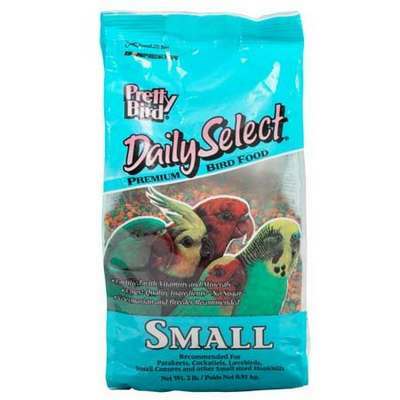 Daily Select foods are great nutrition for the every day diet of all types of hookbills. Proven to be readily accepted by birds, this food is available in small morsels to accommodate smaller sized birds. All Daily Select formulas contain 14% protein and 5% fat, the mix nutritional experts have determined results in optimum health for hookbills. Small Daily Select is for Parakeets, Cockatiels, Lovebirds, small Conures, and other small sized hookbills.